Many years ago after an unpleasant engagement on a cruise liner I visited a zoo. I looked at a penguin on a rock and thought to myself: “You are such a poor creature… your wings are too small, you can not fly and worst of all: The creator didn’t even give you knees… My mind was made up: poor design! Later I did a research: Penguins are ten times more streamlined than a Porsche! With the equivalent amount energy of one liter fuel they can swim 2500km. 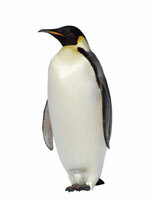 Penguins are excellent swimmer and hunter and they enjoy being in the water. They are more advanced than anything built by humans. And I thought: poor design! Like the little penguin needs water to be in his element we all need an environment where we can develop our strengths. This story is in a way a metaphor for Eckart von Hirschhausen life itself. He realized that the hospital is not the best environment to develop his personal strengths. He jumped into the cold water and changed his environment from the hospital to the stage. Today he is a very successful comedian, speaker and bestseller author. Think about your strengths for a moment? Are you in your element right now? Inspiring. Finding and focusing on one’s strength should be a must learn lesson in every classroom. That is true sometimes we are in the wrong element in our lives and we do not developed our habilities.Thank you for this great storie.